A stand-off between a team implementing reforms proposed to streamline the coffee sub-sector and some major stakeholders now threatens to shatter the hopes of thousands of farmers. The Coffee Sector Implementation Committee (CSIC) was by this time expected to have gazetted Coffee (General) Regulations 2018 draft, which would have ironed out most of the problems bedevilling the sub-sector. However, stakeholders led by officials of coffee growers' co-operative societies rejected the proposed rules for the second time. CSIC was forced to amend some clauses in the Coffee (General) Regulation 2016 before coming up with the present draft but the representatives of smallholder farmers rejected it. With small-scale farmers producing 70 per cent of the country's coffee, CSIC, chaired by Prof Joseph Kieyah, is at a crossroads. The committee sees the hand of coffee cartels working behind the scenes to frustrate reforms. But union officials blame Prof Kieyah, who also chaired the national task force, for not involving them in developing the rules. 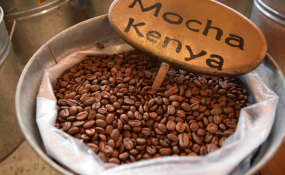 President Uhuru Kenyatta appointed the task force following an outcry that the coffee sub-sector, which was once the leading foreign exchange earner in the country, was dying. Union leaders say the rules are good except for some few clauses, which they want deleted, vowing to reject the draft even if it means going to court. However, on Friday it emerged that the draft is likely to be gazetted any time from next week. "We are working on the new coffee regulations, which are on their way to the office of the Attorney-General. They should be gazetted anytime from next week," said Prof Hamadi Boga, the Principal Secretary, State Department of Agricultural Research. CSIC had early last year promised to have the draft endorsed by stakeholders before the 2018/2019 crop entered the market. This was not to be. Therefore, the produce that growers delivered last year is now being sold using the old Coffee (General) Regulations 2002. The rules are not only outdated but also allow cartels to control the market at the weekly auction, where almost all the coffee belonging to smallholder farmers is sold. And this is what has been happening over the years as most of the companies that are licensed to engage in the coffee business are either the same or are related. For instance, a multinational corporation registers companies in different names and secures diverse licences for these sister firms. Others merge with local companies licensed to mill or market coffee. Thereafter, the related firms meet at the auction and determine the coffee prices. In the new rules, a company is not allowed to have more than one licence. The CSIC has also abolished licensing of marketing agents who have been negotiating coffee prices with dealers at the auction on behalf of growers. Instead, the role they played of preparing sales catalogue of the coffee before it is taken to a warehouse will be done by millers and the Nairobi Coffee Exchange. "We have removed marketers from the whole coffee value chain," said Prof Kieyah. Marketers have been receiving money on behalf of the growers. However, CSIC has proposed a new system of payment where proceeds from coffee sold at the auction will be channelled directly to individual growers through a Direct Settlement System (DSS) managed by a commercial bank. However, coffee union officials say DSS will end up killing co-operatives. Mr Wachira Mwago, the chairman of Barichu Cooperative Society in Nyeri, said if the new rules are gazetted, farmers will have to take action. "We shall definitely react," he said without specifying what action they intend to take.